All across North America, recruiters and HR professionals are getting ready to start filling jobs again after a long holiday season sent them into their personnel caves forcing them to slow the hiring process. The coming weeks will see a flurry of job posting activity. For online recruiting sites, the floodgates are about to open. Are you a career coach looking to make a name for yourself? Are you looking for more exposure to your ideas and advice? Well CareerCloud has a home for you. We are actively seeking guest posts to our advice site. With more than 40,000 monthly readers we'll give you a built in audience that will boost your brand, send more traffic to your website and help you get more clients. CareerCloud is proud to announce it has signed two new employers to its job board. You can now browse truck driver jobs with J.B. Hunt and part-time teaching jobs with Time to Teach. Interested job seekers can now apply. At long last our new directory for job boards and resume tools is now live at Tools.CareerCloud.com. This new free resource contains links to over 1,000 job boards for every country, niche and state. In addition we are starting to compile online resume tools that help you turn create your resume online, many of them for free. A job hunt is a job within itself and only people who are constantly upgrading their skills and knowledge will be able to stay competitive in the future job market. Education is much easier today when many universities and online communities and agencies are offering plenty of free and affordable courses that range from language learning to naval biology. This year Florida, Texas and Ohio lead the pack when it comes to new job announcements. These "Hidden Job Leads" are a great way to job hunt by looking for growing companies about to add jobs. In our continuing quest for building better job seekers, we are proud to announce our new job search news website, CareerCloud Daily News. Located at news.careercloud.com it crawls the latest headlines from many of the popular job blogs written by career coaches and industry experts. Our awesome app for creating visual job ads on social media gets a some new features on the iOS version. Employers and recruiters love InstaJob because it helps them share more pics of their office environments and drives traffic to their job or career sites. Amtrak's career team does a great job using InstaJob. In the example above they simply grabbed their logo and used it as a quick InstaJob to share on their Instagram channel. If you have used our InstaJob app before you know it lets you create one by letting you take a new picture or choosing one form your camera library. But you probably dont have your logo filed away on your smartphone so here's an easy way to put it there for future use. Once its in your library it will always be there for use with InstaJob. Download InstaJob for iOS and Android today to make your jobs more visual! 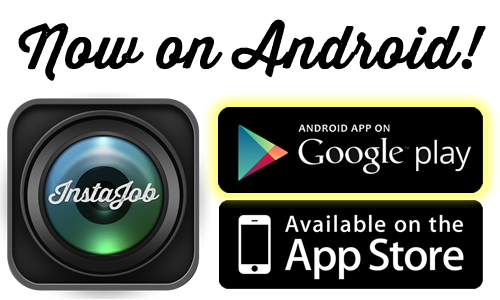 InstaJob, the first ever visual job ad creator, is now available for Android users in addition to the iOS platform. Download it here on the Play store. Launched in the summer of 2013 for iOS, InstaJob allows recruiters to turn any picture of their business, office or employees into a visual job ad that contains their company career site URL and the job title they want to hire for. From there the user can share the picture to any of their social media accounts including Facebook, Twitter and Linkedin. The new Android version has new features including more filters that say "Job Alert" and a bit.ly URL shortener for those web addresses that are too long to display. For more information, click here. CareerCloud Radio hit a new high this past week and topped 1500 downloads per day, a new record. Listen and subscribe here. If you are a career coach, recruiter or just want to share your job search tips on the show, pitch us with a message. Ok employers, we at CareerCloud thought this post would be useful in understanding what CareerCloud can do you for you to help you recruit talent more effectively. So here’s 5 ways you can use our products. 1. Make your social media more effective though an integrated Social Site that promotes all your social media profiles at once. 2. Hire us to convert your career pages into a mobile friendly version so that job seekers can learn more about you on mobile without having to pinch/zoom on every page. 3. Download our innovative mobile recruiting apps from InstaJob to Talent Xray to Recruiting News app. 4. Announce how many you need to hire this year (and why) through ourPremium Job Leads. 5. Subscribe to Talent Ticker, the free recruitment technology newsletter that will alert you to new talent technology, startups and acquisitions in our industry. CareerCloud LLC has launched a new tool to help employers spread the word on the jobs they will soon need to fill. The product is a smartly designed online job flyer called “Premium Job Leads”. It lets employers create a social and mobile friendly hiring announcement that is designed to drive qualified traffic to their career site. Email Distribution: each state page on jobs.careercloud.com has free email alerts that job seekers can sign up for. New job leads are distributed each morning at 7am. Bi-Monthly Newsletter: read by over 3,000 subscribers we will publish the 10 latest job leads that get posted. Social Media: each new job lead will be automatically tweeted to our @career_cloud account (currently over 1200 followers) and our Facebook page for maximum exposure. To post your Premium Job Leads go to: http://jobs.careercloud.com/post/ or click the Post Your Job Lead button from the homepage. Payments are made via credit card only. “We’re excited to offer this new product to help companies announce their hiring needs and help drive applicants to their career pages”, says CareerCloud CEO Chris Russell. “It’s not just another job posting. It’s a unique and memorable way to market all your jobs at once”. CareerCloud’s Hidden Jobs iOS app and website originally launched in 2011 under the domain HiddenJobsapp.com. It was designed to organize the many hiring announcements being written by newspapers, blogs and press release sites so that job seekers could learn about jobs that would soon be coming. In 2013, CareerCloud integrated the site and iOS app into its product suite and pointed the old domain to jobs.careercloud.com which is the new permanent home. Now employers can post directly to Hidden Jobs and tell the world how many jobs they need to fill and why they’re hiring. For job seekers the advantages are obvious. They can get ahead of the job search competition. It lets them ‘company hunt’ by discovering companies in their area who are growing right now. Hidden Jobs App (formerly located at hiddenjobsapp.com) has been tracking new hiring initiatives since the spring of 2011. Each year we put together a list of the top states with the most job leads. This year’s race saw California take the top spot. They had the most job leads in the past 90 days. Last year’s leader, Texas, dropped to 5th. The Midwest had two states in the top 10 via Pennsylvania and Ohio. While California and Arizona represented western states. The South had the most states (6) in the leader board. Full press release can be read here.